Today’s Inglis Ready2Race Sale took “significant strides forward’’ with almost all key year-on-year indicators on the rise. While conceding there was still plenty of room for improvement, Managing Director Mark Webster was pleased with the overall results which saw significant increases in clearance rate (66%, up from 60% last year), average price ($91,148 up 30% from last year), median price ($65,000, up 30%) and sale gross ($8,021,000, a 45% increase). To view our Facebook Live sale review, CLICK HERE. 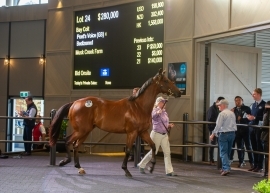 The buying bench at Riverside Stables today was broad with investments coming from China, Hong Kong, Macau, New Zealand, the Philippines, Singapore, Thailand as well as all the major Australian States and Territories. Aquis Farm was leading buyer by both total Lots purchased (six) and aggregate ($510,000). The top end of the market was extremely strong, with significant increases across the board. In total, 11 Lots sold for $200,000 or more today, compared to just two last year, while for Lots sold above $100,000 there were 26 this year, up from 15 last year. There were also several outstanding pinhook results on the day. Lionheart Thoroughbreds was leading vendor by aggregate, grossing $1,550,500 for 14 Lots sold, while Musk Creek Farm was the best by average (for three or more sold), selling all four of their Lots at an average of $153,750. The day’s top Lot came in the first hour of proceedings when Lot 24, a Poet’s Voice x Bedizened colt offered by Musk Creek Farm, was purchased for $280,000 by Hong Kong trainer Dennis Yip. His agent Damian Yap, who was especially impressed with the colt’s breeze up time of 10.35secs at Cranbourne, said the 2YO would be sent for a spell before heading to Warwick Farm trainer Rick Worthington to be prepared for Hong Kong next year. “He is a horse who will probably start off at the sprint trips and then be able to step up to the mile and I believe he will have a bright future in Hong Kong,’’ Yap said. Thai buyer Krit Chittaseni had a big day, not only purchasing multiple Lots including the equal second-top Lot of the day (a Written Tycoon x Edikeni colt) for $260,000, but also winning The Everest prize with Waterford Bloodstock, which could see them win up to $300,000 at the 2019 The Everest through the Inglis slot runner. Their prize came after Lot 172 was drawn out of the barrel in The Everest promotion. Inglis Managing Director Mark Webster was satisfied with the sale’s year-on-year improvement but conceded there was still plenty of work to do. “This sale is all about improving every year and we put a lot of work into that for this year’s sale and I feel we absolutely achieved a significant improvement,’’ Webster said. “There was more depth at the top of the market, better horses and more buyers in that range which is a good sign.